The Eastern trading company presents the following transactions relating to purchasing activities during the month of June 2016. 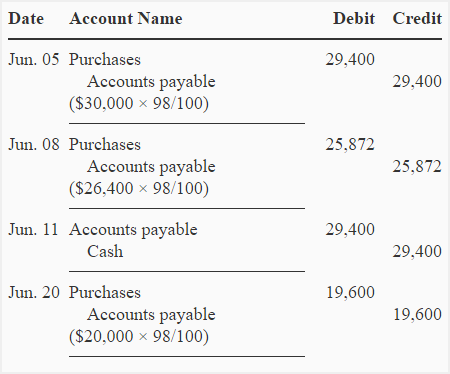 June 05: Purchased goods for $30,000; cash discount terms: 2/12, n/30. June 08: Purchased goods for $26,400; cash discount terms: 2/15, n/20. June 11: Cash paid for goods purchased on June 05. June 20: Purchased goods for $20,000; cash discount terms: 2/20, n/45. The Eastern company uses net of discount method of recording purchases. Any discount lost is treated as financial expense. The financial statements are prepared on June 30. Required: Make journal entries to record above transactions. Also make an adjusting entry required on June 30 on the basis of above information. Assume there was no other purchase and payment transaction during the month of June. The following adjusting entry is needed to record the discount lost on the purchases made on June 8, 2016.